What is thermal mass and why should I care? Thermal mass is the ability of a material to absorb heat and retain it in order to limit fluctuations in temperature: a building with high thermal mass helps level out interior temperatures even when outside extremes between heat and cold exist. Thermal mass is separate from the ability of a material to insulate, but it must be taken into consideration in order to get a good idea how your home will function in actual weather conditions. The thick walls of a handcrafted log home provide insulation value AND thermal mass to help keep it cool in the summer and warm in the winter. 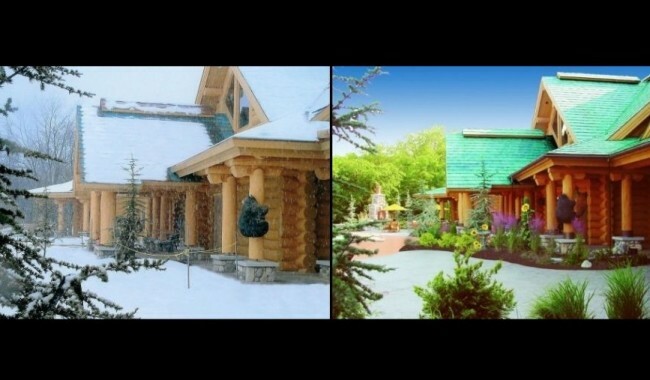 Why are log homes cooler during the summer? Walls with high thermal mass absorb heat during the day, slowing the rate at which the sun heats the space AND the rate at which it cools after the sun is gone. For instance, when the sun shines on a building the exterior surface rises quickly, but it does not reach the inside until the wall becomes saturated with the heat. With high thermal mass it can take hours for heat to flow from one side of a wall to the other. Researchers have found that hot-climate homes with high-mass exterior walls such as logs require less energy for air conditioning than low-mass wood-framed homes. What about winter heating in a log home? During months when night temperatures are significantly colder than daytime temperatures thermal mass is a vital component of passive solar heating. Heat from the sun entering a wall during the day can be stored within the wall for hours, allowing daytime warmth to reach the inside of the home during the cooler evenings, ensuring maximum efficiency from the heating source. While a well-built log home deserves its “cozy” reputation, not all log homes are created equal. The close fitting logs of a full scribe handcrafted log home gasketed with expandable insulation provide reliable insulation AND the benefits of thermal mass. If log homes “shrink” or “settle” will I end up with a drafty house? No! If settlement occurs, a reliable builder will have constructed the log work with means to adjust the logs in order to keep the log connections tight. The door and window openings will be built to accommodate this easily. Your log home will last hundreds of years, and the adjustments that may be necessary in the beginning are a natural part of the way it matures. An established log home builder can prove that he maintains long-term relationships with his clients, and enjoys checking up on his homes over time. The best built log homes will never have gaps between the logs that must be filled or “chinked” but, if your climate is extreme –or if you simply prefer the look—chinking may be installed for added character and protection from the elements. So there’s more to energy efficiency than “R-values”? Tests performed on buildings which were identical except for exterior walls demonstrate that the log home used 46% less energy in spring and 24% less energy during the summer and performed the same as a wood frame structure during the winter even though the wood frame building had a higher R value than the log building. Rather than relying exclusively on R values, thermal mass must be taken into account in log homes where heavy log walls are used to accurately determine a building’s energy efficiency in real world conditions.